Drain the pears, reserving the liquid. Combine the reserved pear liquid, wine, soy sauce, cornstarch and thyme in a small bowl; mix until the cornstarch is dissolved. Heat the oil over medium-high heat in a large skillet; add the chicken breasts and brown well on both sides. Remove and set aside. Add the onion and saute until tender; add the garlic and cook another minute. Stir the cornstarch mixture and add to the skillet; stir until lightly thickened. Return the chicken to pan; cover and cook until the chicken is cooked through, about 10 minutes. Add the pear slices to skillet. 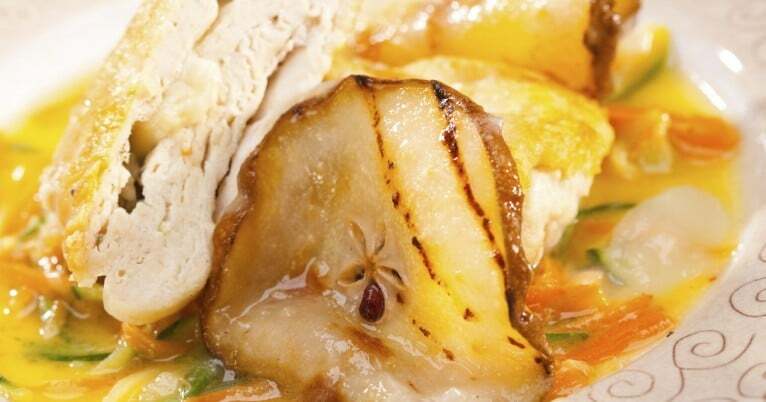 Place the spinach on top of pears and chicken in skillet; cover and cook 3 to 5 minutes or until spinach is wilted. Serve at once.